Gardening time is almost here! Are you ready to get outside and begin planting and watching those veggies grow? I love gardening and cannot wait until I get to put that first seed in the ground. Since it’s nearly time to get started on our gardens, I thought I would share some great gardening recipes with you – that will help you to avoid chemical fertilizers. I have never been a fan of chemicals in the environment. In fact, I do organic whenever I can, and that includes the fertilizers that I use on my vegetable and flower gardens. The great thing about organic fertilizers is you don’t have to worry about your vegetables containing harmful chemicals – plus, it saves you money. So, I realize it’s not quite time to go planting those spring gardens, but the time is coming quickly and it’s always better to be prepared, right? Whether you are planting potatoes, tomatoes, or any and all other veggies, I’ve got some great organic fertilizer recipes for you that will help you to save money and provide your family with only the very best in organic vegetables. Oh, and be sure to check out these other gardening Hacks that will save you time and money. Plants need three things to survive and thrive: Potassium, Phosphorus, and Nitrogen. While store bought chemical fertilizers typically have these nutrients, you can also provide them to your plants without the harsh chemicals by just making them yourself, and most of them can be made with things that you already have on hand, and will probably just throw out. 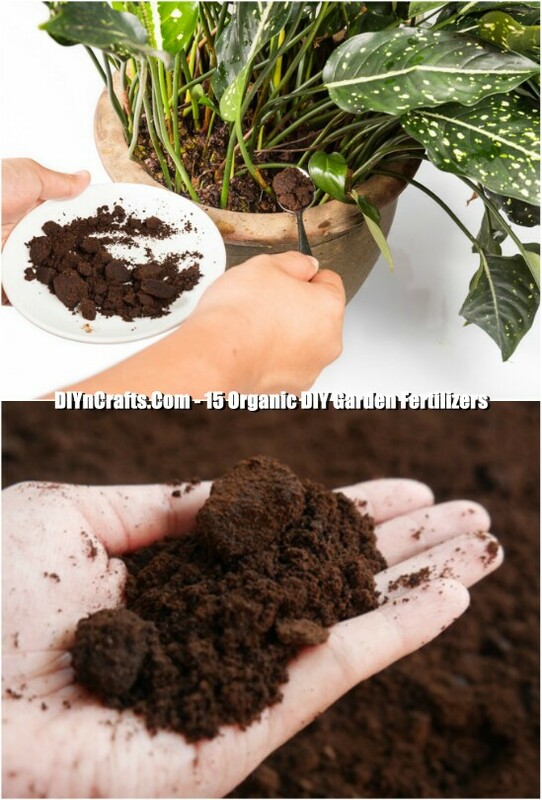 DIYing your fertilizer is a great idea, and we all love to DIY, right? So, these recipes have been gathered to help you to protect your family and the environment. I can’t wait to try some of them, and I hope you use them as well. Also check out these 100 Expert Gardening Tips that are sure to give you even more ideas on how you can save time and money on your garden this year. I’m ready to get planting…are you? Let’s start with coffee because well, you really need coffee, right? Most of us have coffee grounds leftover every day…I know I do. So, you’ll use those grounds, which by the way are filled with nitrogen and helps to increase the acidity in the soil. This is an especially good fertilizer for roses, hydrangeas, and magnolias, but you can also use it on your veggies to help them grow. This is also a really simple recipe – it just takes coffee grounds. You just work your grounds into the soil at the base of your plants, and the coffee will perk those plants right up! Molasses, when you create a compost tea, helps to increase the microbes and beneficial bacteria that those microbes feed on. This helps all of your plants to grow big and healthy. To make molasses tea, you just mix one to three tablespoons of preferably organic molasses into a gallon of water. Then just add this tea to your plants once a week or so and watch them grow! For centuries, gardeners have been mixing this simple tea fertilizer to provide nutrient to plants, and it’s really easy to make. Mix 1/4 cup of Epsom salt with two cups of urine – this may seem like an odd step but it really does work. Mix this with two cups of ash from your wood stove or fireplace and then fill the five gallon bucket up with grass clippings or even weeds that you pull from your garden. Fill to the top of the bucket with water and allow the tea to steep for three days. Strain the tea after three days and dilute it by half with water. You can do this in a two liter bottle. Just add directly to the soil around your plants. If you prefer something a bit more simple, you can mix Epsom salt with water for a good fertilizer, too. You can find Epsom salt on Amazon, and it’s really inexpensive. It’s also a great source of magnesium and sulfur and is especially good for roses and tomatoes. This is a no-fail fertilizer. You just can’t get this one wrong. Just add a tablespoon of salt to a gallon of water and use this to feed your indoor and outdoor plants. Okay, this one is better if you actually live near the sea…wouldn’t we all love to live near the sea. It’s another recipe that has been used for centuries. Seaweed contains mannitol that helps to increase the ability of your plants to absorb the nutrients that are naturally found in soil. You can use fresh or dried seaweed – for those of us not lucky enough to live near a beach, you can purchase dried seaweed at most organic stores. You’ll need eight cups of chopped seaweed. Fill a five gallon bucket halfway with water – use rainwater if you can, and then add the seaweed. Let it steep for three weeks and then strain. It stores well for up to three weeks. Then just mix half seaweed tea and half water in a two liter bottle and water your plants. Put those grass clippings to work the next time you mow your lawn. Place fresh grass clippings in a five gallon bucket and then cover with water. You’ll need to let this sit for about five days. Then dilute the fertilizer tea by adding 10 cups of fresh water to one cup of tea and pour on soil. The grass clippings help to add essential nutrients back into the soil. Okay, so you’ve probably heard of using banana peels to help plants grow, right? We all know that bananas are rich in potassium. They also contain calcium and phosphorous and are perfect for fertilizing flowering plants and fruit trees and plants. 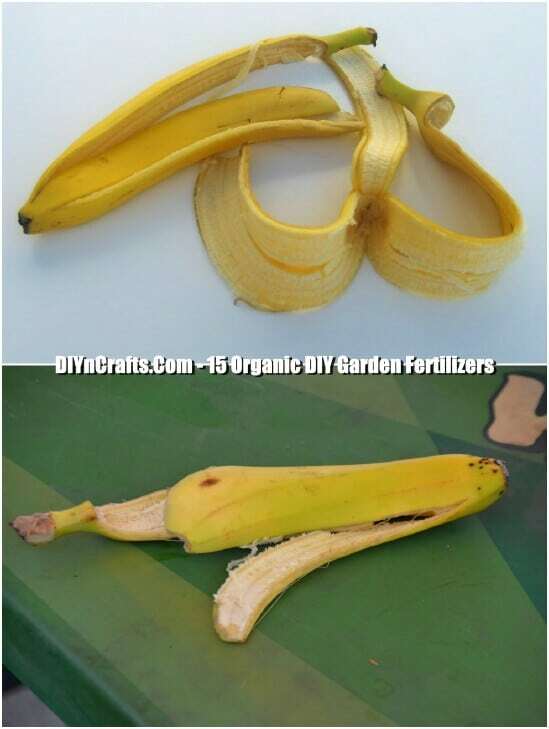 You can just bury banana peels in the soil at the base of your plants and allow them to decompose. You could also freeze your overripe bananas (if you aren’t planning to make banana nut bread, that is) and then bury those next to your plants. Or, make a spray by soaking banana peels in water for three days and then spray your plants or seedlings to add the needed nutrients. This is also a great recipe for houseplants. Fish waste, including fish parts and the water that fish are swimming in, is really good for your plants. This is another centuries old recipe and it’s one that takes a bit more effort to make and longer to create. The results though are astounding. Note that you’re using fish waste, so the smell is going to be less than pleasant. So, you’ll want to fill a 55 gallon drum about a third of the way with two parts water and one part fish waste. Let this steep for about 24 hours. Once that time is up, fill the drum to the top with water and cover loosely. You’ll want to let this ferment for a few weeks, normally around three weeks for best results. Add this to your soil around plants. The ratio is three gallons of liquid per 100 square feet of garden space. If you can get past the smell, this is a great fertilizer that adds tons of nutrients to the soil. It’s also a good way to dispose of fish waste and water if you have a freshwater aquarium. Egg shells are something else that you probably have tons of throughout the week and typically just throw out. The shells contain a lot of calcium which helps with cellular growth in your plants. Calcium deficient soil can lead to blossom end rot on tomatoes and various other garden catastrophes. This egg shell fertilizer will help to end that. 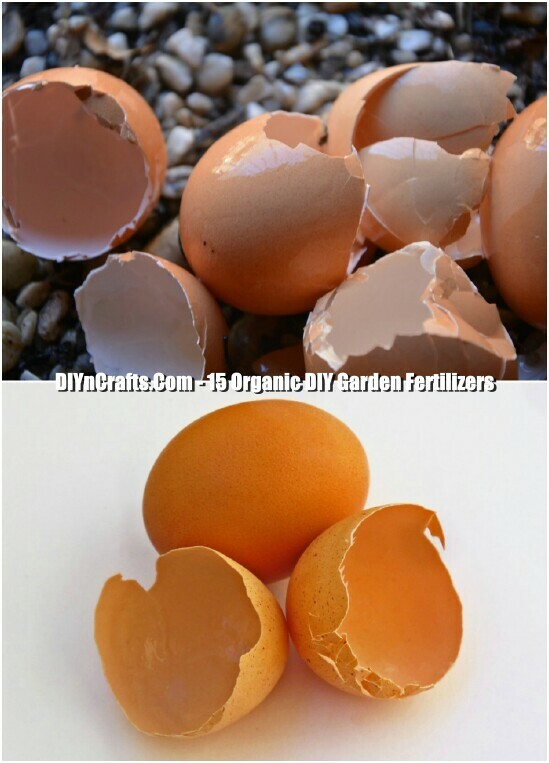 Just crush up used egg shells and then bury them in the soil. Or, you can make a spray with 20 egg shells and a gallon of water. Boil the shells in the water for just a few minutes and then leave overnight. Strain the shells and add the water to a spray bottle to spray directly onto your soil. Sometimes you just don’t have time to wait for days or weeks for a fertilizer tea to steep. If that’s the case, you can make this quick fix fertilizer tea that actually uses real tea. In an empty gallon jug, just add a teaspoon of baking powder, a teaspoon of ammonia, three teaspoons of instant iced tea, and three teaspoons of molasses. You also need three tablespoons of molasses and three tablespoons of 3 percent hydrogen peroxide with 1/4 cup of crushed bone scraps, one crushed egg shell, and half of a dried banana peel. The ammonia adds nitrogen while the tea has tannic acid to help plants absorb nutrients. Hydrogen peroxide feeds oxygen to plants and of course, bananas add potassium. Once you’ve added these ingredients, fill your jug with water and let it sit for an hour, then water your plants. Fireplace ash provides calcium carbonate and potassium to plants. All you need to do is add the ash to the garden bed and then massage it into the soil. It may be best to do this right before planting so that you don’t risk knocking your plants over or harming them while massing the ash into the soil. Vinegar has acetic acid that is great for certain plaints. You can use this on roses and various other houseplants as well as vegetables in your garden. 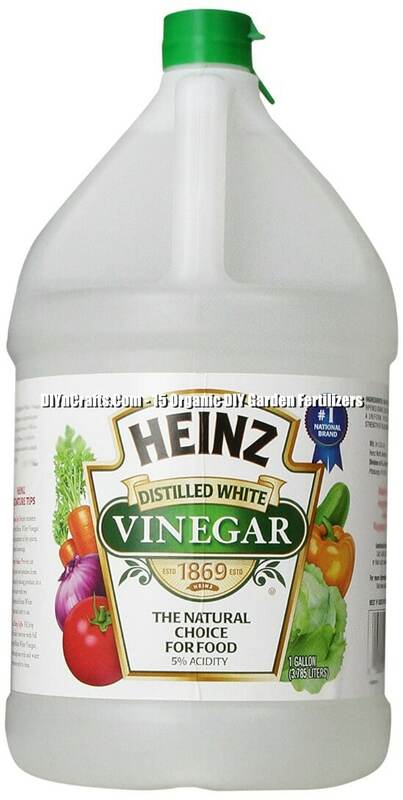 To make vinegar fertilizer, just combine a tablespoon of white vinegar (only white vinegar as apple cider vinegar doesn’t have the same nutrient properties) with a gallon of water. Use this solution to water your plants about once every three months for best results. I have garden space all of a sudden for the 2019 season, Yay! And, am on a budget. Is it possible to tell- which of the above fertilizers provide a good balance of NPK? If I were to mix Urine, or grass clippings, for N, with bananas for P, what would be a really good source of K to balance this all out?